These sets of 4-panel canvas prints make for a great decorative element on any wall. Choose a different picture for each panel or split one picture over 4 different panels. Image is reviewed preprinting for quality check. Sometimes one main photo doesn't do the trick: we need multi panels to really create an impression! Multi panel canvas prints, made with a fast runaround, are fantastic home interior ideas. Whilst they are very modern, they also retain the classic elegance of a professionally-printed photo. This technique is most effective for landscape shots of scenery or flora, but can also work equally well with dynamic action pictures. 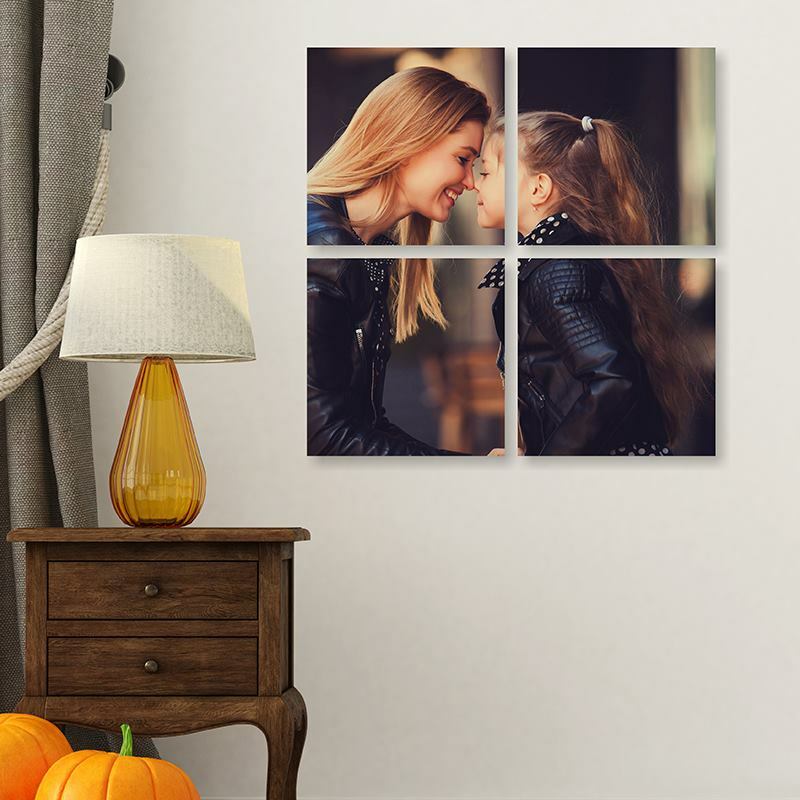 For example, if you have a lovely and high quality photo from your last holiday to the beaches in the south of France, how about displaying that memory on a canvas split into four main segments? Great addition to my family room. Photos look beautiful on the canvas and the split look makes it completely different. Recommending this website to friends and family. I am very pleased with products. Came timely and good quality. This made for a perfect decoration in my family room! If you're looking for rectangular panels instead of squares, we have Triptych Canvas Prints and Diptych Canvas Prints to suit your space design. Triptych Canvas Prints come in sets of three panels, and our Diptych offering comes in sets of two panel prints. As with our Muliti-Panel Canvas Prints, our graphic designers will personally work with your image to make sure it looks pleasing even when split into multiple different panels. The same great quality that is guaranteed with all our canvas prints is provided here as well. You can design each of the four segments individually, so if you would prefer to do so in a way that will display each panel in a row, either vertically or horizontally, then that's is entirely possible. Great for sweeping landscapes or tall landmarks. You will receive four, beautiful canvas prints, which are hand stretched with your personal design, around an FSC Certified pine wood frame. We use eight wedges on each and every canvas and FSC stretcher bars. It might not be the obvious thing to do with your photos, but its impact is demonstrably impressive, and this method of printing really does have the ability to transform any atmosphere in your home. There are so many different formats and sizes available for your multi-panel canvas, so you can tell a great story through your photos. It is often the case that viewing a photo from one perspective means that whilst one gets a holistic sense of the picture, at the same time one lacks an understanding of its constituent parts. With this technique, however, the eye is drawn to and focused on a certain element of each photo, allowing for a more profound understanding of the photography skills involved and enhancing the impact of your photos. Design your diptych canvas online and spice up your space.